University of Iowa/Iowa City - February 1965: First MA review. It was suggested I work with the human form in both drawing and painting. "This will personalize and focus the work" the Review Committee said. This was the start of the human form project. I had not thought of using the human form as a subject for painting. I was a committed abstractionist. How would I incorporate this image into my non-narrative program? In my mind, to use the figure in an art work meant telling some kind of story. I am not a narrative artist/painter. I messed with some narrative ideas at the start of the figure project, but it all fell apart because, for me, there was no story; only the image. I scrapped the narrative and concentrated on creating the human image as subject; just layout the figure form and go from there! Stripping the narrative from realism in drawing and painting was the solution allowing this project to grow into an exciting adventure. Whether it personalized my art — I suspect it did. At least my confidence in learning and using new skill sets was setup for a life time of art studio practice. From the beginning in 1965 the art of Francis Bacon heavily influenced this project. To a lesser degree, I used the art of Alberto Giocometti and Willem de Kooning. deKooning was a short lived influence; 1968 only. This project covers these dates: Iowa City, Iowa 1965-1967; Pittsfield, Massachusetts 1968-1970; East Calais, Vermont 1970-1974. 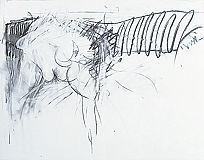 Figure drawing and painting in Iowa City and Pittsfield MA were executed in both oil and acrylic on canvas and linen using brushes. In 1970, after moving to Vermont, I replaced the brush with airbrush; spray painting creating forms using stencils. In January 1973 I returned to using brushes. Drawing was the blueprint for all figure work. The project ended in summer 1974. 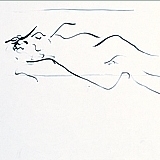 As of July 23, 2013 (nearly 40 years), I have not returned to using the human form in my studio practice. Code: #) Title; date; support; media; (=~)size (w x h) [all measurement in inches]. Click on thumbnail to see larger image with image viewer. 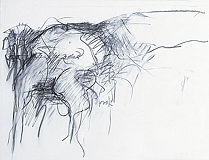 1) Figure; 1968-69; Ink/Paper; =~14"h.
2) Figure; 1968-69; Charcoal/Paper; =~20"h.
3) Figure; 1968-69; Charcoal/Paper; =~20"h.
4) Figure; 1968-69; Pencil/Paper; =~8"h.
5) Figure; 1968-69; Ink/Paper; =~8"h.
6) Figure; 1968-69; Pencil/Paper; =~8"h.
7) Figure; 1968-69; Pencil/Paper; =~11"h.
8) Figure; 1968-69; Ink/Paper; =~11"h.
9) Figure; 1968-69; Pencil/Paper; =~11"h.